Safe cycle lanes – Track Line B.V.
Colour-coded cycle lanes marked out on the main road surface are a good alternative to separate cycle paths. The distinctive colour of a cycle lane makes it stand out from the rest of the road. 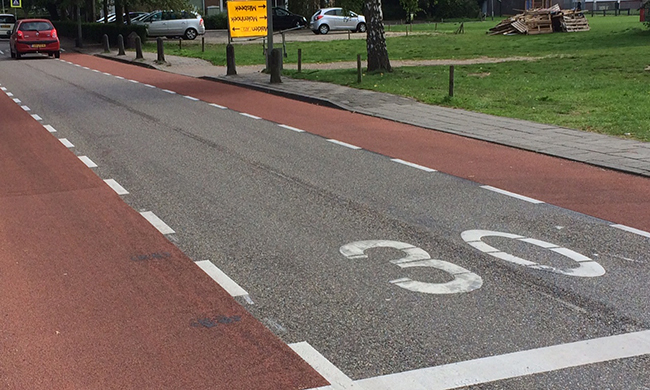 In addition to the colour coding, the right level of surface roughness is essential for cycle lanes to improve tyre grip and minimise the braking distance of cyclists. It helps to improve the safety of all road participants. Track Line Tyregrip is the perfect coating for creating cycle lanes on existing road surfaces. Track Line Tyregrip is a high-quality coating with an innovative composition which ensures that Track Line Tyregrip will provide a safe, non-skid surface whatever the weather conditions. This makes Track Line Tyregrip the perfect solution for improving the quality and therefore the safety of cycle lanes. Cyclists know they can rely on the safety of Track Line Tyregrip. Read more about the features of Track Line Tyregrip.